Malaria is no fun. I caught it and it felt like my bones were melting through my skin. But when you take the right medicine it goes away very fast. Unfortunately many, many children don't have access to the medicine (or the test) and die. 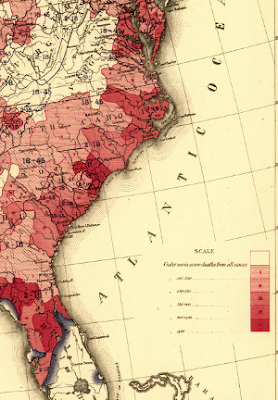 This image shows malaria incidence in the US in 1870. With 100 years of democracy, and during a time when factories were being built on a scale never before imagined, the US was as endemic or more endemic to malaria than many of the worst places in Africa today. The maps shows that in many places (including Washington DC) more than 10% of the deaths were caused by malaria. The average lifespan was about 40. Many people wonder what is wrong with Africa. Why is it so corrupt? Why is there so much disease? Why is it developing so slowly? Charts like this remind me that Africa is developing much faster than the West ever did (although perhaps not as fast as the East). I hate to rain on your parade, but didn't Africa import antimalarial drugs, not invent them? It's easy to grow when you can import knowledge, another thing if you have to invent it. @Tschäff, I don't think I follow. I said nothing about importing antimalarials, nor inventing them. I did talk about access, but I don't think that is what you are getting at, and it certainly wasn't core to my thesis (which is: the West took time to develop, Africa needs time too). And then your second sentence about inventing knowledge...I have no clue what you are talking about. Is this a Turing test? How you gonna holler without facebook?